Elizabeth Price, who is exhibiting User Group Disco at the British Art Show 7, has created a series of video works that form an imagined institution, which glamorises kitsch objects, design pieces and ornaments such as ceramic lamps, figurines, mirror balls and a bingo caller, placing them on rotating plinths in this sculpture hall, as is often to be found at the centre of a gallery. Similarly Conner Linskey’s film Transition at the Royal College of Art MA Interim Show must have been influenced by Price, along with Richard Prince’s works such as Untitled (Original) at the Frieze Art Fair in 2007. In this, Prince presented a car like it might be shown in a car show, on a turntable with a scantily dressed model, both adopting and critiquing the attributed glamour used in this means of promotional advertising to direct the eye perhaps unsuccessfully towards the vehicle. Where Price films moderately sized design objects, Linskey has filmed cars that are probably designs from the vehicle design department of the college, rotating the camera around the car and applying a similar backing track to stimulate the senses and create desire in a different manner to Prince’s model. 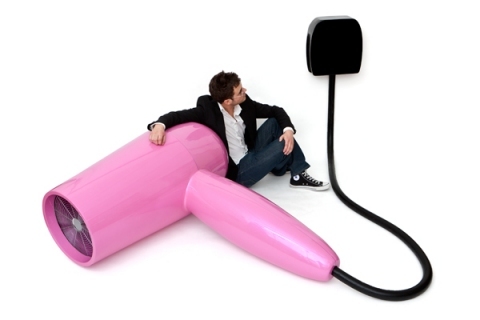 Michael Schultz in the Goldsmiths BA Art Practice exhibition has similarly referenced Prince, at the opening at least, by having an attractive model wearing a black cat suit to draw attention to his giant pink Hair Dryer (2011) sculpture, to create desire for the work and demonstrate the scale and femininity of it in terms of colour and usage. From a tool for drying hair, as the model may use, this sculpture incorporates a fan that blows towards her as might be used in a photo shoot to create flowing hair or fabric. The sculpture itself is finished to such a high standard that one could mistake it for being a commercial product coming from a modern day equivilent of Brobdingnag in Jonathan Swift’s Gulliver’s Travels. The plug in particular appears to reference works by Claes Oldenburg, such as Giant 3-Way Plug Scale 2/3 (1970), on exhibit at Tate Modern, and whereas this Oldenburg piece is an American fitting, Schultz’s is made in the form of the British design, giving the work some sense of identity. However, since the wall the work is plugged into in the exhibition is temporary and freestanding it does seem slightly a shame that you can’t see the electrical pins protruding on the other side, though you wouldn’t normally see these, and if a giant was to try and use it they’d find the stylised cord rather short, like trying to dry your hair with a hand dryer and perhaps indicating an interest in the failure of design, particularly if this was directly scaled up from a found object. Jeremy Hutchison’s MA exhibition at the Slade demonstrated a similar interest in design objects, however instead of filming them he has created a museum type display albeit with a very low budget finish to the tables on which pieces sit, slightly heading towards the aesthetic of warehouse shelving. Where Leckey, Price and Linskey have glamorised existing design pieces, Hutchison turns design on its head, perhaps it should be called anti-design. Hutchison has not laboured on these pieces at all. Documentation shows he commissioned them to be specially made by manufacturers across the world, taking an existing product and making one change at the choice of the constructor. In essence the process engages factory workers to become the artists of these sculptures whilst Hutchison acts as both curator and facilitator to this community of new artists. Perhaps, alternatively, the art within this work actually lies in the engagement between artist and manufacturer in line with Nicolas Bourriaud’s Relational Aesthetics, as they have doubts about the idea and their responsibilities to produce a product that is fit for use, along with the time this work will take away from the normal manufacturing process. Meanwhile Paolo Cirio produced replica Visa credit cards for the Visionary Trading Project, which one might use to purchase the above works, to be freely disseminated with the intention to critique the banking system for creating money from nowhere to trade, which led to the credit crunch. Whilst the setting up of this financial institution, Basic Credit Network, revolves around an intelligent analysis of the banking system and slightly tweaking this to reflect how public ownership of the banks could be distributed, the most interesting and humorous element of this work is the detail of the small print on the cards and website, not accepting responsibility or liability for the card’s use or malfunction, much as such legal terminology is applied to real businesses. As the other works discussed here look at creating desire for art and design, the credit card enables you to act upon that desire without thinking about where the money will come from and whether you can afford luxury items. Mark Leckey: See, We Assemble is at the Serpentine Gallery, Hyde Park until 26th June 2011. The British Art Show 7: In The Days of the Comet is in Glasgow until 21st August. Elizabeth Price’s work is at the Gallery of Modern Art, Royal Exchange Square, G1 3AH whilst the show is split between there, the Centre for Contemporary Arts and Tramway. The show then moves to five venues in Plymouth from 17th September to 4th December. The Goldsmiths, University of London Undergraduate Degree Shows are on until 27th June in New Cross, SE14 6NW. The Visionary Trading Project is at Guest Projects, 1 Andrews Road E8 4QL until 26th June.